Aneurysm is often detected by chance during an ultrasound or X-ray examination. With identifying of its required urgent treatment because aneurysm rupture leads to hemorrhage, which is often fraught with death. At the moment of rupture of the aneurysm person feels pain, and his arterial pressure begins to fall rapidly due to the large loss of blood. Despite the obvious danger of the disease, governments of many countries still do not pay enough attention to this problem. In the United States every year by an aneurysm die almost as many people as by AIDS (24 thousand people). At the same time for the fight against these diseases, respectively, is allocated 500 thousand dollars and 1.4 billion dollars. The sudden rupture of the aneurysm broke lives of such outstanding people as Albert Einstein, Charles de Gaulle. It is believed that the acquired aneurysm is more common in patients older than 50 years. In young it usually develops as a result of injuries sustained in road crashes or extreme sports. There are several types of the aneurysm. Aneurysm of artery of the brain - the most common form of this disease. It is characterized by a local expansion of the brain arteries. In case of hemorrhage at rupture of the aneurysm is marked a sharp pain, a person loses consciousness. In half of the cases patients die, many of those who survived, remain disabled. Thus only 25 percent of patients with aneurysm before the fatal moment experience a headache similar to migraine. Often this disease is wrongly diagnosed as a brain tumor. Aortic aneurysm - is a very dangerous disease. It can develop at different sections of this blood vessel. This diagnosis is detected for 50 thousand people a year, and by results of researches, aortic aneurysm is detected in 7 percent of the dead who died for another reason. In the later stages of the disease, patients complain of a pressure pain in one or another part of the body. There are aneurysm of the thoracic aorta, aneurysm of the aortic arch, a feature of which is that it can develop within 20 years after the injury. There is also an aneurysm of the abdominal aorta, which is often asymptomatic. However, very thin patients, putting a hand to stomach, could feel the pulsation and pain. If this aneurysm pushes roots of the spinal cord, the pain becomes unbearable. With aneurysm of peripheral vessels (blood vessels of the extremities) patients may feel severe pain in the legs and arms. Heart aneurysm is characterized by a bag-shaped protrusion of the heart wall. Acquired heart aneurysm occurs in the place of myocardial infarction and is detected in 5-20 percent of patients who had undergone of infarction. Over time, in the place of the lesion is detected a scar, which gradually bulges out. 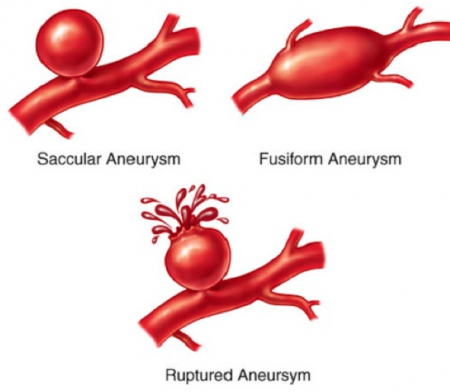 Aneurysm can develop immediately after infarction, and a few months after. Upon detection of any form of aneurysm is required surgical intervention. Essence of operation consists in excision of the damaged portion of the vessel and its replacement with plastic prosthesis or a fragment of a blood vessel from another part of the body.